I don’t move as well as I used to and my footing is a little less sure. I try to keep up with you like I used to, but these days I just need a few extra moments to rest and an extra blanket to keep me warm… and maybe a few other things, just to keep me safe. As energetic puppies and kittens inevitably age, their ability to navigate their home environment can become more of a challenge. Slippery floors, steep stairs, noisy sleeping quarters, and excessive heat, cold, dryness, and humidity are all hazardous to elderly pets, but a few simple home and yard enhancements can reduce the likelihood of preventable illness or injury, as well as protect your home from damage. Whether it’s Adopt-a-Senior-Pet Month, or whether you simply have a passion for rescuing less-adoptable animals to give them a loving forever home, taking in an older pet is one of the most gratifying adoptions you will ever perform. 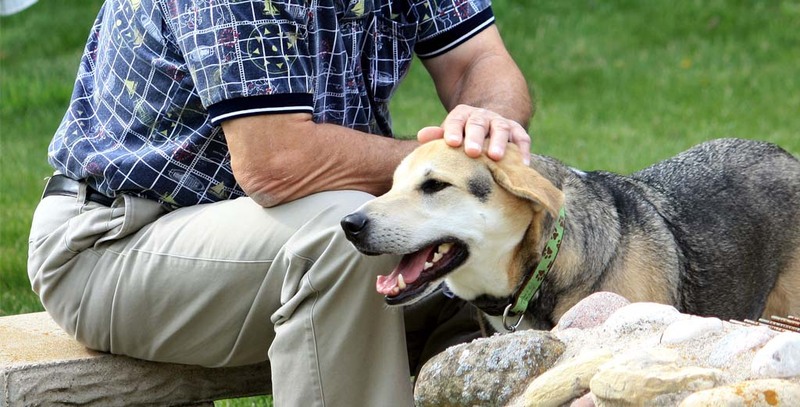 Not too long ago we covered 7 Reasons to Adopt a Senior Pet, as well as 9 Organizations Helping Senior Animals, but once you’ve taken the step and brought a new family member home, here are a few tips to keep your aging pet safe both in and out of the home. Keep your pet’s bed, which should be lined and insulated, in a warm location near the rest of the family, to help them feel safe and involved. Provide a blanket for them to knead or paw as needed to make themselves comfortable. A second bed in quieter, more relaxing location is recommended to give your pet a sanctuary to retreat to when loud company is present, or during stressful situations. Outdoor excursions should be shortened and carefully monitored to ensure your pet doesn’t get too warm or too cold. Booties protect your pet’s paws from cold snow and concrete and make for a comical addition to morning walks! Rugs covering portions of linoleum and hardwood can give your pet a cozier place to spontaneously nap than a cold, hard floor can offer. During warmer weather, giving your pet their own rotating fan mimics air blowing in from an open car window, as well as provides a much needed breeze to keep their temperature even. Pro Tip: No matter the outside (or inside) temperature, be sure to watch your pet carefully for any signs of distress or discomfort and adjust as necessary. Senior pets are much more tolerant of their surroundings, and may not make their discomfort known until it’s too late. Much like puppy-proofing your home can keep your pooch out of areas that could harm them, similar precautions are needed for your more mature companion. Elderly pets may struggle with stairs as their joints become stiffer, often due to arthritis, and their footing becomes less secure. Building a simple outdoor ramp with carpeted lining for traction can do wonders for an older pet’s confidence and enable them to come and go much more easily. A small set of stairs inside a bedroom allows nighttime snuggle buddies to tuck themselves in without having to jump quite as far. Whenever a rug is used in the home, a non-slip pad beneath it will help prevent slips. For their comfort as well as safety, keeping your senior pet’s nails trimmed gives their pawpads better contact with the floor for increased traction and safer footing. It also keeps their nails from getting caught on carpeting or broken on hard surfaces — both of which can be extremely painful. Monitor your yard for sharp or exposed rocks that could injure your pet’s sensitive feet. If adding new gravel to your landscape, choose rock that is rounded and more comfortable to walk on. While senior pets are typically housebroken, as they age, it often becomes more difficult to “hold it.” Often, older pets develop bladder problems that make doing so impossible, which can destroy your carpet. But a few simple options can keep your carpet from turning into a life-sized puppy pad. Invest in wood floors. Accidents are much easier to clean off of a solid surface than to pull out of carpet, which tends to hold in stains and odors. Keep in mind that wood floors can be bothersome to an older pet’s worn pawpads, as well as chillier in the winter. If wood floors aren’t an option, floor rugs are a safe alternative to either protect your carpet and allow for easier, spot-specific cleaning, or to cover wood floors to protect your pet’s sensitive pawpads. Stain-resistant and water-retardant carpet options are also available to make messes a snap to clean. If the problem becomes too consistent, pet diapers are an adorable and easy option that only requires a slight bit of adjusting on your pet’s end (no pun intended). Since older pets have the tendency to “wet the bed,” investing in a water-proof liner for their sleeping area and linens that are easily washable is important to allow you to launder them as often as necessary. Have you ever owned a senior pet, or modified your home to help make them comfortable? Let us know in the comments!